The App which has been both welcomed and criticised by industry professionals is free to access and use. The App, being a web app, cannot be downloaded so network coverage is required for access. It is aimed at contractors carrying out work on buildings built or refurbished prior to the year 2000, and is available across all platforms, i.e. android, iPad, Windows etc. Also on the menu are links to: images of some common asbestos-containing products and typical uses; a page for locating a Licensed Asbestos Contractor; information on asbestos training; additional asbestos information via the HSE asbestos home page; accessibility information and privacy and cookies policies for the App. The App is a click to advance system, in that users are presented with a Start button, which when pressed takes them through a series of pre-set questions, the questions posed being dependent on the answer to the preceding question; eventually, the App delivers instructions relevant to the job in hand. Users are first asked for the type of building they are working on  options: Residential | Business premises. Having selected a building type, they then have to choose from the options: Inside | Outside. Selecting either of these results in them being asked when the building was built  options: Before 2000 | In or after 2000 | Dont know. Selecting Before 2000 brings up the question: What are you working on? together with 17 options in the form of a list of products/scenarios including: Airing Cupboards/Asbestos Insulating Board (AIB), Asbestos Insulating Board (AIB) general, Toilet seat or cisterns, vinyl floor tiles, etc. and Don't know. Should the user select a product/scenario where AIB is involved, they are then asked how long will the job take?  options: More than two hours | Less than two hours. Work on any AIB material lasting more than two hours, even if different tradespeople are sharing the work, needs a licensed contractor. The time limit includes setting up, cleaning and clearing up. Below this is a button which will take users to a page where they can enter either a postcode or allow location detection. Using either of these two options brings up information on local HSE licensed asbestos contractors close to the area identified. 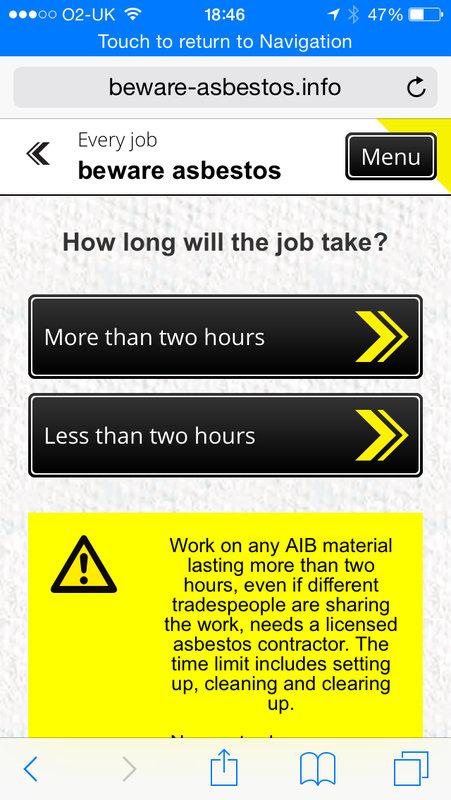 Choosing Less than two hours for work involving AIB products, results in users being invited to select from the following list of common tasks: Drilling; Removing; Cleaning; Repairing; Painting; Protecting from damage. On selection of the desired operation, the relevant How-to guide is presented. Each guide has a similar structure  three sections under the headings: Use the right kit; Keep dust down; Clear up properly. In the App these sections appear on successive pages. For most categories of work the right kit is defined as correctly fitted FFP3 face mask and Type 5 disposable overalls (which workers are warned not to re-use), and taped plastic sheeting to cover the work area to help catch waste. Regarding the overalls, the guide recommends they should be one size too big with the legs pulled over the top of footwear. However, under right kit for at least one task is listed erection of a timber/plastic enclosure, while for minor work the use of a face mask is sometimes said to be unnecessary. The sections on keeping down dust and clearing up are very specific to the task being considered. In general, the precautions recommended seemed sensible. With regards to disposal, there is a common theme in that all waste arising from the work (including disposable clothing and masks) has to be double bagged and conveyed to an appropriate asbestos disposal site. 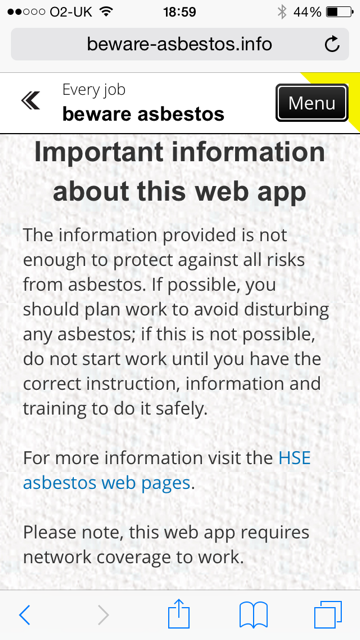 The HSE web app was released nationwide in September 2014. Assisting with the release were Trade Point, the trade side of the DIY chain B&Q. They participated in the release by making available, overalls and the guide sheets free of charge (excluding Northern Ireland)3; there was also a heavily promoted Blog and in-store posters. It was hoped, through this participation, that the Trades would pick up the information when buying materials and use it, thereby reducing the number of tradespeople being exposed to asbestos through work activities. There were those who believed that the information being provided via the App could have been clearer or in some cases, even removed. Discussions and comments were made about the App on the HSE Web-community pages, on social media and in trade magazines. Some of the points raised were related to working on AIB. 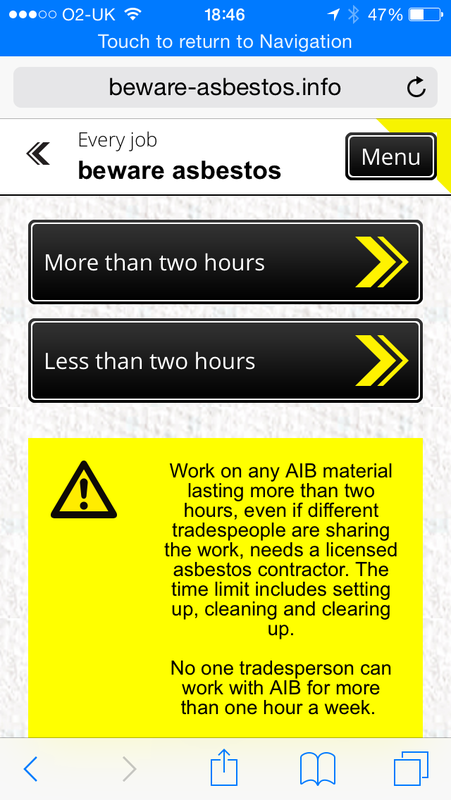 The App asks if the work will last for more or less than two hours, when in fact the HSE restriction on non-licensed works is one hour, per worker, per week. However, the App also makes this very point if one reads the full information on the screen; but the user is required to scroll down to read it. Unfortunately, it is not always evident that there is significant text offscreen  particularly on a small device such as a phone. A phrase in the APP that solicited a good number of comments was: wear a correctly fitted FFP3 mask. Current regulations5 in the United Kingdom state that all close fitting respirators must be fit tested; they must be worn on a clean shaven face and for a period of no longer than 1 hour, after which a rest period should be taken by the wearer.4 Other types of respirator can be selected where these criteria cannot be met. The App does not mention any of these requirements. Other areas of criticism include the lack of information on the type of vacuum required for work with asbestos. The HSE specifies the use of a BS8520-3/2009 Type H vacuum cleaner with HEPA (High Efficiency Particulate Arrestor) filter. Such devices should have a DOP (Dioctyl phthalate) test every 6 months and, when full, must only be emptied by a HSE licensed contractor. Although the App does mention an H Type, the definition of the H Type and the full requirements are not described in detail. Comments were also raised about the response to selecting the option that work was to be carried out on a post 2000 building: No asbestos risk followed by Buildings built in or after 2000 will not contain asbestos. The issue here is that second-hand equipment, building products and plant could potentially contain asbestos. In an environment where recycle and re-use are the buzz words of industry, there is a potential for post 2000 buildings to contain asbestos. A further area of concern regarding the App is the limited information on training. In the current regulations on asbestos work in the UK, the Control of Asbestos Regulations 2012, Regulation 10 states: to work on asbestos, asbestos information, instruction and training must be in place. Although the App does mention this on the introductory page and via a menu option, it isnt reiterated at regular intervals nor, as some have claimed, clearly enough. This has brought a high level of criticism from organisations and individuals who have invested large amounts of time and effort in the promotion, development and delivery of training. The campaign aims to raise awareness of asbestos risk with a hard to reach group - e.g. sole trades people, SMEs, and micro businesses working on small sites and projects where asbestos may be disturbed - and get them to take steps to protect themselves. It is specifically focused on non-licensed activities, which the law does not require to be done by licensed contractors. The aim of the campaign is to help this particular group of tradespeople to work more safely. By making the information easy to understand and digest, there is a greater likelihood that people will take positive action to protect themselves and that we will help save lives. We have developed our materials using evidence about how our target audience thinks and behaves and what we can do to encourage them to work more safely. As a result, the web app, asbestos kits and other materials have been developed specifically to address the needs of the campaign's audience. It is campaign material which complements other HSE guidance on asbestos; it does not replace HSE guidance. HSE is aware that not all the specifics of the law are included in the campaign material; but that was never the intention - the requirements of the law are covered by existing HSE guidance. Both the web app and the material in the asbestos safety kits make it clear that the information provided is not enough to protect against all risk from asbestos; that users should avoid disturbing asbestos; and that if this is not possible, they should not start work unless they have the correct information and training. To date, the HSE have stated that the app has been accessed by a great number of people; the information received shows that the App is working and that the message is getting out there. But is the message delivered clear enough, given that the intention is to target a hard-to-reach sector  primarily, self employed tradespeople and small contractors  where unexpected problems tend to be tackled creatively; with recourse to previous experience rather than expert advice. This mind-set means that, even where the App is consulted, independent workers may be tempted to extend the boundaries set by the HSE, thinking themselves to be adequately protected when they are not. Although the App itself states do not start work until you have the correct instruction, information and training, there is no legal requirement for training in order to carry out the tasks outlined. Couple this with insufficient detail being given with respect to protective and other equipment to be used in areas of medium and high asbestos exposure risk, and there is the potential for endangering life and contaminating work sites. Self-employed tradespeople, in particular, do not like to turn work down. 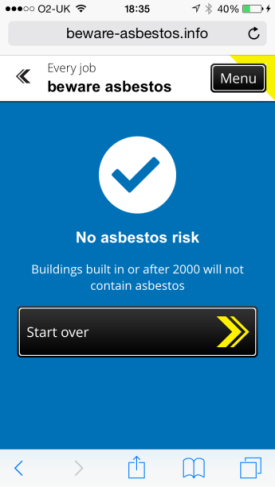 With the help of the App some may well think themselves able to take on jobs that include marginally more asbestos work than can be legally undertaken without the services of a licensed asbestos contractor. Even though the App has been released with good intentions it is difficult to see how such problems can be avoided. However, with more awareness may come more compliance, and in the meantime workers will be better protected than they would be with no instruction on working with the asbestos products they might encounter, sometimes inadvertently, in the course of their work. 1 www.beware-asbestos.info (images in this article captured from this website on IPhone 6, iOS 8.3 are reproduced for information purposes only). 4 Control of Substances Hazardous to Health (CoSHH) Regulations 2002.